Wichita, KS — Earlier this year, a cop was fired after he shot a little girl inside her own home. Showing that they are willing to hold their own accountable, the officer was charged with felony aggravated battery this week. In January, a Witchita cop was placed on administrative leave after discharging his firearm inside a family’s home—in a cowardly attempt to kill a dog—and hitting a little girl instead. Then, in an actual moment of accountability, Officer Dexter Betts was fired and he’s now been charged. The officer was hired last January and barely made it a year before being fired. According to Kansas.com, Betts becomes the first cop in decades to be charged in an on-duty shooting that resulted in an injury or death. According to the family’s attorney, the girl, hit by bullet fragments, was so directly in the line of fire when the officer shot at her dog that the flashlight he shined from above his gun barrel illuminated her face right before he fired. Naturally, Betts’ attorney, Jess Hoeme, says her client did nothing wrong and was totally in the right when he nearly killed a little girl to prevent the possibility of her small dog biting him. “I expect that this will be litigated at length because I firmly believe that Mr. Betts did not act recklessly under the circumstances, and we look forward to presenting our defense in court,” she said. As Kansas.com reports, Charley O’Hara, attorney for the girl’s family, said the child’s mother is pleased. “She said she was happy with the charge that was filed, and it was the correct thing to do.” Still, because of the shooting, “the girl is still struggling,” O’Hara said, without elaborating. Betts is now due in court on April 11. As KAKE reports, officers were called at around 6:15 p.m. to the report of a domestic disturbance and suicidal person in the 1500 block of North Gentry, near 13th and Hillside. Officer Paul Cruz said in a news release that officers were told a 33-year-old man in the home had held a gun in his mouth and choked a dog. When officers arrived at the home, instead of getting the woman and four children to safety, they went in guns blazing after learning that the gun the man had held in his mouth was under a pillow in a bedroom. 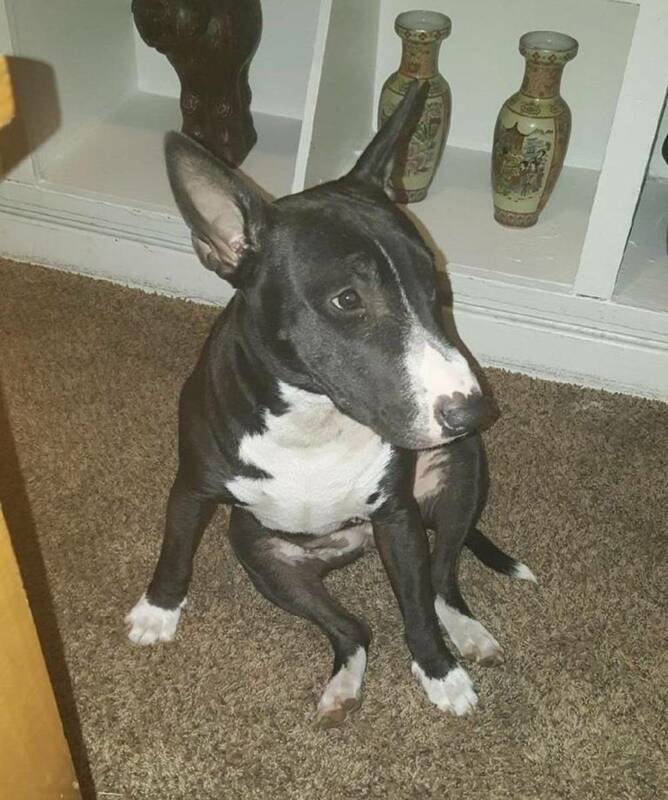 The dog is described as a small 35-pound miniature English bull terrier name Chevy. The poorly aimed shot then ricocheted off the floor and a fragment of the bullet struck the innocent 9-year-old girl in the forehead just above her right eye. Had the bullet struck just an inch lower, the poor girl could’ve been permanently blinded or worse. Danielle Maples, the girl’s mother recounted the horrifying experience to the press noting that her daughter was sitting down on the couch when she was struck in the head. Also, her 6-year-old son was standing right next to the officer when he fired not one but two shots. The little girl was brought to the hospital and treated for her injuries. Luckily, Maples’ three other children were not physically injured. However, the emotional scarring left by this experience could last a lifetime. Maples explained how at the hospital doctors removed three fragments of the bullet from her daughter’s head showing just how close she’d come to being blinded. Wichita Police Chief Gordon Ramsay reportedly told Maples that he watched the body camera from the officers in the room when Betts opened fire. As Kansas.com reports, she said Ramsay told her in a phone conversation “that what he witnessed was not only morally wrong but against their protocols and training.” He didn’t say why, she said. As for the suicidal man in the home, luckily he was not killed and completely cooperated with police. He was also brought to a hospital where he was given a mental health exam, according to the police statement. According to the Wichita Eagle, the case will be reviewed by the District Attorney’s Office in addition to an internal review to determine if department policies were followed. Sadly, police officers attempting to kill dogs and hitting innocent people in the process is an all too common occurrence. As TFTP previously reported, responding to the house of a woman requesting medical treatment, a Columbus police officer arrived at the front door and immediately shot her 4-year-old daughter when attempting to kill their dog. Fearing that a jury would award the family substantially more money, the Columbus City Council unanimously approved a $780,000 settlement with the innocent girl’s family. Prior to shooting the little girl, a police officer in Iowa shot and killed an innocent woman while attempting to kill her dog. The cop was not charged. While tasked with the authority to carry a deadly weapon in all situations, this heavy responsibility is often disregarded, with innocent civilians — as well as other officers — becoming victims in the process. Contributed by Matt Agorist of thefreethoughtproject.com.